The Bed Butler `Elegant` Bed has been designed by our skilled craftsmen working with the very best of materials and manufacturing processes to produce an elegant bedstead. 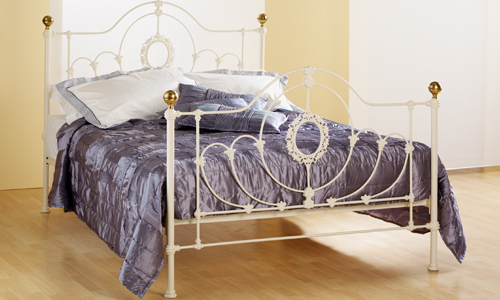 This bed has been designed to fit into both the modern and traditional bedroom with both the bed head and foot incorporating beautiful circles and swirls with a detailed metal feature in the centre. 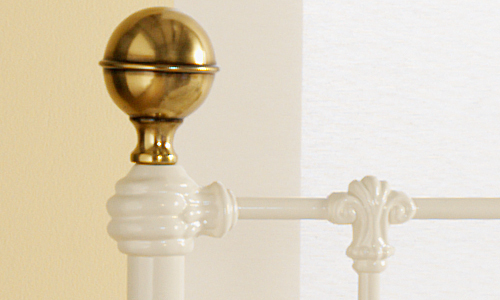 Each corner post is finished with heavy antique brass domes ensuring it will never date with time but will always remain a centre piece to be proud of in the bedroom. There are many aspects that must be taken into account when choosing the right bed for your bedroom. One factor that must be considered is the dï¿½cor of the bedroom. This elegant Bed with its modern and traditional look will fit with most decors. The overall height of the bed head is 134.5 cms and the foot height is 109.2 cms. The posts are one and quarter inches thick ensuring the bed is very solidly made and will last many many years. The bed is finished in white lacquer, again making it fit with most decors. 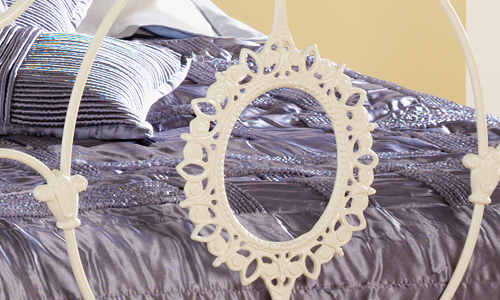 It is available in the traditional Ivory finish with is designed to fit the dï¿½cor of most bedrooms.